Explore a selection of hosiery that fits your lifestyle. 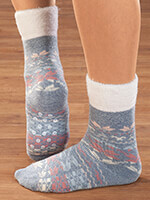 As We Change offers women’s socks, knee-highs, trouser socks and tights. We also carry unique items like lingerie toes and footless hosiery. Need extra support? Browse our collection of support stockings including support knee highs and support tights.